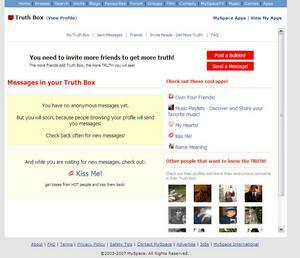 On the New MySpace Platform, RockYou Owns 3 of the Top 10 Applications: Truth Box, the First Application to Reach a Million Users, Kiss Me, and Name Meaning. SAN MATEO, CA--(Marketwire - May 11, 2008) - Throughout its two-year existence, RockYou has seen nothing but explosive growth. In its early days, it blazed a trail by creating the first slide-show widget for MySpace. RockYou widgets still receive over 130 million widget views a day. When Facebook opened its platform for developers, RockYou stormed in and became that network's most prolific and popular developer of social applications, as well. The company then proceeded to create Facebook's first ad network, helping to give other applications the initial traction they need and offering a potent new way for brands and advertisers to reach their audiences. It has also embraced Google's OpenSocial standard and has taken the lead among OpenSocial applications on the internationally popular social network, hi5. As more and more consumers in key youth demographics shift their attention away from traditional mediums like television and towards the internet and online social networks, marketers face unprecedented challenges. Building brand awareness and loyalty becomes increasingly difficult among a population -- 12-25 year olds -- that is inundated with information yet has a fleeting attention span. Engagement has become a vital metric, and on the social networks, this population is engaged. RockYou is a recognized master of engagement and "virality," the mysterious force that enable applications to catch fire and proliferate across the networks as friends promote the application to other friends. "MySpace's platform is new territory for everyone, and possessing some of its most successful applications is great news for us. The rapid success of Truth Box, Kiss Me, Name Meaning, Super Comments, Movies and other applications affirms our position as the leading provider applications on the OpenSocial platform." RockYou is the leading innovator, creator and distributor of widgets and applications on the social web. The company offers customized branding and advertising opportunities on Facebook and can deploy applications across any social network, including hi5, MySpace, Bebo and Friendster. RockYou's advertising platform is the largest Ad Network on Facebook and the most dynamic way for brands and advertisers to reach application users. Headquartered in San Mateo, California, RockYou is funded by Sequoia Capital, Partech International and Lightspeed Venture Partners. For more information, please visit http://rockyou.com/corp/about.php.